03/06/2011: Added a Thorsen Early 7/16x7/16 Ell-Shaped Double Socket Wrench. 04/14/2009: Added an Action 2028A Combination Wrench. 03/10/2009: Added a Thorsen 375 3/8-Drive Screwdriver Bit. 03/08/2009: Added a Thorsen 632 1/2-Drive Deep Socket. 03/03/2009: Added a Thorsen 2012 Combination Wrench. 02/24/2009: Added a Thorsen 2218 Offset Box Wrench, a Thorsen 2014 Combination Wrench, and a Giller 2020 Combination Wrench. 02/23/2009: Added an Action 2024A Combination Wrench. 02/21/2009: Added a Thorsen 3020S Open-End Wrench. 02/16/2009: Added a Thorsen 77J 3/8-Drive Ratchet and a Thorsen 2024C Combination Wrench. 02/15/2009: Added a Thorsen 3019 Open-End Wrench. 02/14/2009: Added an Action 530A 1/2-Drive Socket and a Thorsen 536 1/2-Drive Socket. 02/13/2009: Added a Thorsen 3016 Open-End Wrench, a Thorsen 3018 Combination Wrench, a Thorsen 2020C Combination Wrench, and a Thorsen 522M 1/2-Drive Socket. 02/12/2009: Added a Thorsen 3020 Open-End Wrench and an Action 2022A Combination Wrench. 02/11/2009: Added a Thorsen 53 1/2-Drive Extension. 02/09/2009: Added list of hints for manufacturing dates. 02/08/2009: Added a Thorsen 428J 3/8-Drive Universal Socket and a Thorsen 2022C Combination Wrench. 02/06/2009: Added section on Giller Tool, added a Thorsen 1240 3/4-Drive Socket and a Thorsen 2026 Combination Wrench. 02/05/2009: Added a Thorsen 2030 Combination Wrench. 02/04/2009: Added a Thorsen Early 514 1/2-Drive Socket. 02/01/2009: Added a Thorsen Early 532 1/2-Drive Socket. 01/31/2009: Updated file name, added a Thorsen 2120 Offset Box Wrench and a Thorsen 77 1/2-Drive Open-Style Ratchet. 08/05/2008: Added a Thorsen 1622 Offset Box Wrench. 02/24/2008: Moved page, not much content yet. 02/10/2008: Added a Thorsen Speed-Hed Combination Wrench. 09/27/2007: Added a Thorsen 79 3/4-Drive Ratchet. Thorsen was a well known brand of tools in the latter half of the 20th century, with roots going back to the founding of Thorsen Manufacturing in the 1920s. We recently found sources of information on the company's early history and later development, and are now able to fill out more of the company's history. Thorsen was founded in 1929 by Edward A. "Ned" Boyd, Sherm Haskins, and Pete Mortensen, all recently ex-employees of P&C in Milwaukie, Oregon. Ned Boyd had been the manager of P&C Tools, the sales and distribution organization for the P&C Hand Forged Tool Company, and left after a dispute with the company's owners. (See our article on the P&C Hand Forged Tool Company for more information.) Boyd managed to hire away two key P&C employees to start the new venture, Sherm Haskins as the production manager and Pete Mortensen as the tool-and-die maker. This first organization is believed to have been called the Thorsen Manufacturing Company and was located in a factory building at 5321 Horton Street in Emeryville, California, now a part of Oakland. Since none of the founders were named Thorsen, the question naturally arises as to the origin of the company name. An interesting story on this is related by John C. Derville Sr., Ned Boyd's business associate at P&C Tools and a lifelong friend. According to John Derville, when Ned Boyd named the company, the name Thorsen was "picked out of thin air" because Thorsen was a Swedish name, and Swedish steel was famous for its high quality. Before proceeding further we should mention an apparent discrepancy in the founding date for Thorsen. Most later Thorsen documents cite 1926 as the founding date; for example, a 1967 catalog displays a logo showing "Fine Mechanics Hand Tools Since 1926". However, we have fairly solid evidence that the company founders all remained at P&C in Oregon until sometime in 1929. This evidence includes a newspaper article from August 1 of 1929, with the owner of P&C complaining about recent rumors and events pointing to the founding of Thorsen. There's even a much later trademark registration for the name "Thorsen" that lists the first use date as July of 1929. By the early 1930s Ned Boyd had recast Thorsen into the mold of his old employer P&C Tools, with both a retail and distribution organization as well as the manufacturing operation. The catalogs from this time are ambiguous about the company structure, with the name "Thorsen Tool Company" appearing to apply both the retail and factory operations. However, from a later account it appears that after 1931 Ned Boyd was primarily (or exclusively) occupied with running Thorsen Tools Inc., the retail and distribution company, with Sherm Haskins continuing to manage Thorsen Manufacturing, the production company. At some point Pete Mortensen had left Thorsen to return to P&C in Oregon. A 1931 catalog lists the main office at 1475 Bush Street in San Francisco, along with a branch sales office at 2521 S. Hill Street in Los Angeles and the factory at 5321 Horton Street in Emeryville. This catalog shows a "Thorsen Tools" logo consisting of the letters "TT" in a circle, a mark that can be found on some older tools. The catalog also notes the Thorsen "Techniheat" process, which it claims was perfected in April of 1931. By 1935 the Thorsen Tool stores were operating as full service suppliers of automotive tools, offering sockets and wrenches made by Thorsen, plus a wide variety of tools from other manufacturers. A catalog printed in 1935 (without copyright) lists the Thorsen socket tools and wrenches, noting the "Techniheat process" used for heat treating. However, the major part of the catalog (probably more than two-thirds) is devoted to listings for tools by other makers, particularly Herbrand. Other brands mentioned (or recognizable) in the 1935 catalog include Bonney, Champion DeArment, Diamond Calk Horseshoe, Kennedy, Rimac, Utica, and Wilde. This 1935 catalog was undoubtedly published by Boyd's retail operation, yet continues to show the ambiguous treatment of the company structure. The inside cover shows Thorsen Tool Company in bold type, with the "General Sales Office" at 1475 Bush Street in San Francisco, and with E.A. Boyd as "General Manager". By 1940 Thorsen Manufacturing was struggling as a business and the owners were interested in selling. Thorsen had only five employees at this time, including Sherm Haskins, the manager and one of the company's original founders. Harry Peet, a local engineer and entrepreneur, was interested in purchasing the company, and with additional money raised from family members was able to acquire the company in December of 1940. The new owners became Harry Peet, his brother-in-law Roy Shurtleff, and Roy's son Lawton L. Shurtleff. Harry Peet and Lawton Shurtleff were actively involved with running the company, while Roy Shurtleff remained as a limited partner backing the venture. The new owners had undertaken a significant challenge, as Thorsen was pretty run down by this time. The production equipment was from the World War I era and in need of repair or replacement, and monthly sales were less than $3,000, with a comparable amount required for replacement of broken tools. One of the first changes made by the new management was to terminate these exclusive sales arrangements, which fortunately were not binding terms in the contracts. This displeased the distributors, but paved the way for future improvements in sales for Thorsen. The beginning of WWII in 1941 brought a much needed increase in business for Thorsen. Lawton Shurtleff was able to land a number of war-related contracts in 1941, before leaving to join the navy in 1942. During the war a number of family members filled in to help Harry Peet run the company, which had expanded to three shifts of operations to keep up with the orders. Sales rose from $40,000 in 1941 to $154,000 in 1944, with profits increasing from $8,000 to $41,000 over the same period. As an aside, the Thorsen Tools Inc. distributorship under Ned Boyd remained in operation until at least the mid 1940s. The Thorsen Tool catalog M from around 1946 shows a modest selection of Thorsen tools, plus a much larger selection of tools from numerous other makers. The list of companies carried as a distributor included Bridgeport Hardware, Champion DeArment, Cleveland Twist Drill, Diamond Calk Horseshoe, Duro Metal Products, Fairmount Tool & Forging, Heller Brothers, Kennedy, Lisle, Reed & Prince, Ridge Tool, Utica Drop Forge & Tool, Vlchek Tool, and many others. Although the distributor catalog continued to show "Thorsen Tool Company" on the front, Ned Boyd is believed to have had no further involvement with Thorsen Manufacturing after the change in ownership. The overtime work and stressful conditions during the war had taken a toll on both the equipment and management at Thorsen. When Lawton Shurtleff returned to California in 1946, he found that Thorsen desperately needed new investment and upgraded equipment. After some discussion with Harry Peet, Shurtleff and a new business partner bought out Harry Peet's interest in the company, with the intention of building Thorsen into a major national tool company. The following years were difficult as Shurtleff invested to improve production while trying to keep the company solvent. By the mid 1950s, production efficiency had been greatly improved and an aggressive new sales team was in place, and Thorsen was well on its way to becoming a major player in the tool market. During the 1950s Thorsen Manufacturing registered a trademark with the text "Thorsen Hot Forged Tools" combined into a distinctive logo, and this logo appeared prominently on the company's catalogs and toolboxes. Somewhat later Thorsen registered "Action Hot Forged Tools" as a trademark and began using "Action" as the brand for a second (economy) line of tools. During this period Lawton Shurtleff received two design patents for tool displays, showing the company's new emphasis on sales ability. By the time of the 1967 catalog AJS-120, Thorsen was offering a wide selection of sockets and drive tools in drive sizes 1/4, 3/8, 1/2, and 3/4, wrenches in combination, open-end, and box styles, chisels and punches, and a few miscellaneous tools. Production still took place in Oakland, but at an upgraded facility, and the catalog includes an illustration of a modern-looking factory with "Thorsen Manufacturing Company" on the front. In 1968 Lawton Shurtleff agreed to sell Thorsen Manufacturing to Hydrometals, Inc., an industrial conglomerate. The intended acquisition was noted in the August 15, 1968 issue of The New York Times. The transaction was structured as a stock swap and appears to have closed in early 1969, based on the information in an SEC News Digest from April 14, 1969, which notes that Hydrometals had filed to register securities for a secondary offering. Thorsen continued in operation as a division of Hydrometals, with Shurtleff remaining as the CEO until 1977. Hydrometals had previously acquired the Giller Tool Corporation of Dallas in 1963, with the acquisition noted in the November 15, 1963 issue of The New York Times. Giller appears to have operated primarily as a defense contractor, and the February 19, 1966 issue of The New York Times notes that the Giller division of Hydrometals had received $1.9 million in new defense contracts. After the 1969 acquisition of Thorsen, Hydrometals reorganized its subsidiaries to make Giller Tool an operating division of Thorsen Manufacturing. It's not known whether Giller Tool had its own manufacturing facilities or made use of contract manufacturers; however, as a division of Thorsen, Giller would have had access to Thorsen's manufacturing equipment. This helps resolve a long-running mystery concerning the close resemblance of many Giller-marked tools with the corresponding Thorsen model. In 1977 Hydrometals was acquired by Wallace Murray, another industrial conglomerate. In the late 1970s Thorsen moved its headquarters to Dallas, Texas and built a large manufacturing facility there, and somewhere along the way the corporate name changed to the Thorsen Tool Company. During this period the company appears to have devoted more resources to tool engineering, as the only known tool patents assigned to Thorsen were filed in the early 1980s. There was also a resurgence of interest in trademarks, with a number of applications being filed around this time. Some time later Thorsen appears to have run into financial trouble, and the new factory was sold, possibly to National Hand Tool. The Thorsen operations (possibly just the name and trademarks) were eventually acquired by Elgin National, originally a manufacturer of watches. Elgin also owned GC Electronics, a maker of supplies and tools for the electronics industry, and at some point GC Electronics and Thorsen Tool were merged to form GC Thorsen, Inc. as a subsidiary of Elgin. A 1995 catalog from GC Thorsen lists the address of Thorsen Tool as 1801 Morgan Street in Rockford, Illinois, and notes that Thorsen had been providing tools since 1926, with more than 2,000 tools in their current product line. The catalog offers sockets and drive tools in 1/4, 3/8, and 1/2-drive, plus a variety of wrenches, pliers, screwdrivers, air tools, and some specialty tools. The catalog illustrations show highly polished chrome finishes, with knurled handles on ratchets and raised panels on the wrenches. However, by this time Thorsen is believed to have sourced most (if not all) of their tools from other manufacturers. In 1995 GC Thorsen was purchased from Elgin National by Katy Industries. (As Katy is a public company, numerous records of this transaction are reported online.) Under Katy the Thorsen Tool operations were separated from GC Electronics, and an annual report for 2000 listed Thorsen Tool as a value-added distributor, with tools sourced primarily from Asia. In 2001 Thorsen was acquired by Olympia Group, a distributor of hand tools and related products. Only a few patents have been found for Thorsen, all of them filed many years after the company's founding. Two design patents from the 1950s describe specialized stands used for displaying merchandise, and a patent from the early 1960s covers a method of packaging. 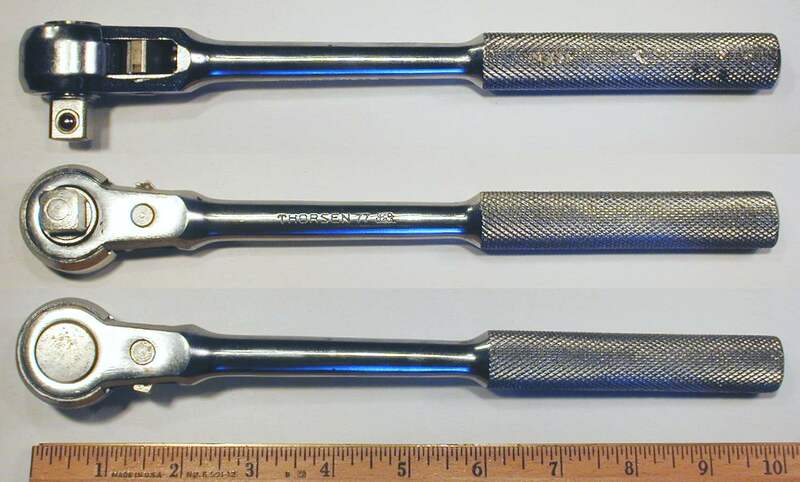 Several much later patents from the 1980s describe improvements for ratchet wrenches. An early Thorsen catalog claims a trademark on a logo with the letters "TT" in a circle, but no registration has been found for this mark. Thorsen does appear to have used the mark on tools, however. In 1957 Thorsen Manufacturing filed a trademark application for "Thorsen Hot Forged Tools" in a distinctive design, with the first use date listed as March 1, 1953. The trademark registration was issued as #665,346 on August 5, 1958. The design for this trademark places "Thorsen" in an inverted "V" shape above a rising sun, and we'll refer to this as the "sunrise" logo in the text. The trademark "Action Hot Forged Tools" was filed by Thorsen Manufacturing in 1961, with the first use listed as 1957. In 1979 the Thorsen Tool Company filed a trademark application for the name "Thorsen", with the first use date listed as July of 1929. The trademark registration was issued as #1,147,068 on February 17, 1981. At that time Thorsen Tool listed its address as 2527 Willowbrook Road in Dallas, Texas. Thorsen tools are not known to have any form of date code marking, and in general the tools have minimal markings and few (or no) decorative features. This lack of changeable markings makes it difficult to determine a manufacturing date for most Thorsen tools, except perhaps at a very coarse level. Once we have better catalog coverage, we'll attempt to develop some guidelines for estimating manufacturing dates. The following list has some preliminary observations that may help estimate a production date for some tools. Plain or Cadmium Finish. Thorsen production from the 1930s and 1940s most likely had a plain or cadmium finish. Chrome-Plated Finish. By 1950 Thorsen was probably using a chrome-plated finish for its tools, as this was generally expected for a competitive tool product. Action Trademark. The Thorsen "Action" trademark was first used in 1957. Tools in the Action line had an "A" suffix appended to the model number for the corresponding standard tool. "MFD. U.S.A." Marking. By around 1962 Thorsen had started adding "MFD. U.S.A." to the markings on its tools. "=" Marking on Sockets. At some point Thorsen changed the markings on sockets to add an "=" symbol on each side, as for example the marking "=22M THORSEN MFD. 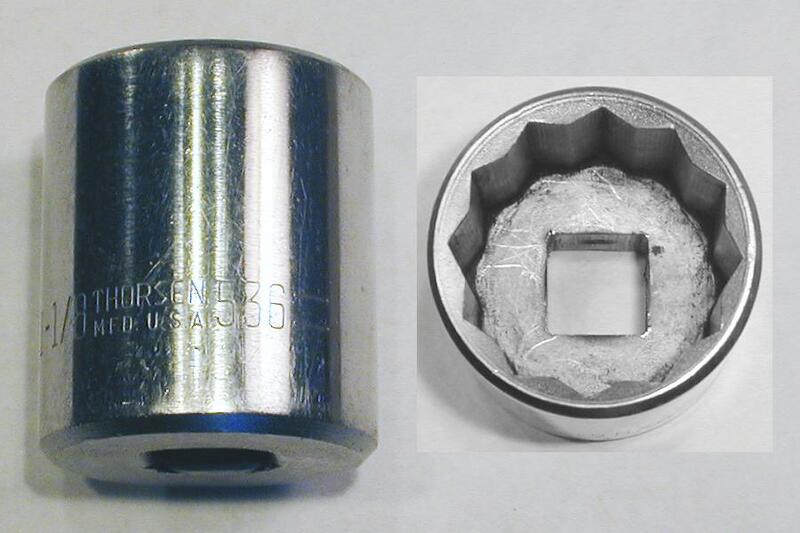 U.S.A. 522M=" on a 1/2-drive 22mm socket. This marking change has been observed on sockets made using hot-forged construction, indicating that the change would have preceded the new factory built in the late 1970s. This "=" marking style for sockets remained in use at least until 1991. Cold-Formed Sockets. By the late 1970s Thorsen had built a new factory in Texas, and state-of-the-art production at that time would use cold-forming for sockets. Five-Digit Model Numbers. A 1991 catalog from GC Thorsen shows a recent transition from the older legacy model numbers to a new five-digit system. For example, a model 10M 1/4-drive 5/16 socket became a model 10210 socket. Note though that by this time some Thorsen tools were already using five-digit model numbers, and for some odd reason the model 80M 1/4-drive handle remained as a model 80M. Panelled Handles for Wrenches. The 1991 catalog shows wrenches with a V-shaped depression and a dart-like raised center panel. Information on the early history of Thorsen and P&C is based on recollections of the Derville family, as passed along by another tool collector. The Derville family are the owners of the General Tool Company of Portland, Oregon, a tool distributor now in its 80th year of operations. Information on the development of Thorsen Manufacturing from the 1940s onward was obtained from a family history The Shurtleff and Lawton Families Genealogy and History by William R. Shurtleff and Lawton L. Shurtleff. Lawton Shurtleff was one of the owners of Thorsen from 1940 through the 1970s, and this book provides a wealth of detailed information about the company. Currently we have rather limited catalog resources for Thorsen, as summarized in the following table. Thorsen Tools 1931? Mentions "Techniheat" process perfected April, 1931. Lists sales office at 1475 Bush Street in San Francisco. No. 3536 Thorsen Tools 1935 Lists three retail stores. Includes extensive listings of Herbrand and others. M Thorsen Tool Company 1946? Distributor catalog, lists Thorsen tools and dozens of other makers. AJS-120 Sets and Open Stock 1967 Company listed as Thorsen Manufacturing with factory in Oakland. No mention of retail stores. HDLD-221 Hardware Merchandising Programs 1967 Shows tool displays for retail. A 1995 catalog from GC Thorsen, Inc. provides a snapshot of the company's later history, by this time primarily a distributor rather than manufacturer of tools. Thorsen's early production can be distinguished by the use of plain or cadmium finishes, together with a rough forged or machined surface. Fig. 1. 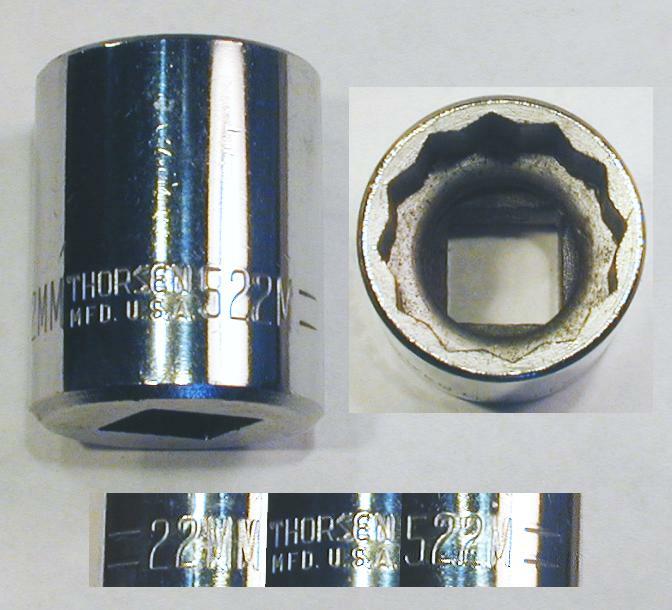 Thorsen 79 3/4-Drive Ratchet, with Insets for Side View and Marking Detail, ca. 1930s. Fig. 1 at the left shows an early 3/4-drive Thorsen 79 ratchet with a push-through plug, marked with just the company name and model. The overall length is 19.0 inches, and the finish is plain steel. Fig. 2. Thorsen Early 514 1/2-Drive 7/16 Socket, with Insets for Broaching and Marking Detail. Fig. 2 shows an early 1/2-drive Thorsen 514 7/16 socket, stamped "Thorsen" with the size and model number. The finish is plain steel with a rough surface. The drive end of the socket has a dimple in one wall (not shown) to help secure the detent ball of a drive stud. Fig. 3. Thorsen Early 532 1/2-Drive 1 Inch Socket, with Insets for Drive End and Broaching. Fig. 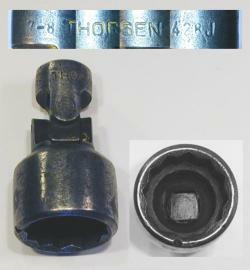 3 shows an early 1/2-drive Thorsen 532 1 inch socket, stamped "Thorsen" with the size and model number. Fig. 4. Thorsen Early 632 1/2-Drive 1 Inch Deep Socket, with Inset for Broaching. Fig. 4 shows an early 1/2-drive Thorsen 632 1 inch deep socket, stamped "Thorsen" with the size and model number. The drive end of the socket has a hole drilled for a cross-bar, a typical feature for spark plug sockets. Fig. 5. Thorsen 428J 3/8-Drive 7/8 Universal Socket, with Insets for Broaching and Marking Detail. Fig. 5 shows an early 3/8-drive Thorsen 428J 7/8 universal socket, stamped "Thorsen" with the size and model number on the drive end. Fig. 6. 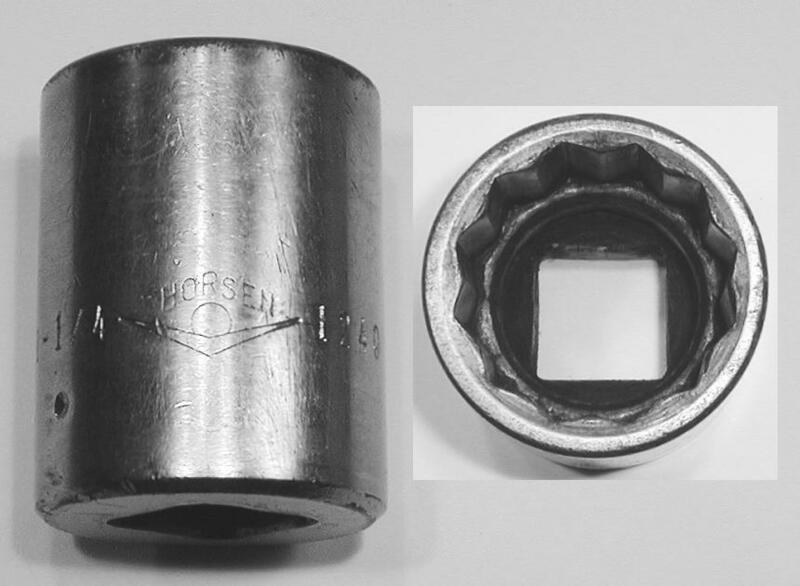 Thorsen Early 7/16x7/16 Ell-Shaped Double Socket Wrench, with Insets for Side View and Marking Detail, ca. 1929 to Early 1930s. Fig. 6 shows an early Thorsen 7/16x7/16 Ell-shaped double socket wrench, stamped with "Thorsen" and the fractional size on the shank. Fig. 7. Thorsen 1622 11/16x25/32 Offset Box Wrench, with Insets for Side View and Marking Detail. Fig. 7 shows a Thorsen 1622 11/16x25/32 offset box wrench, stamped with the Thorsen name and fractional size at one end, with the model number and other size on the reverse. The overall length is 11.8 inches, and the finish is cadmium plating. A comparison of this wrench with a similar P&C model such as the P&C 2222-E Offset Box Wrench shows the great resemblance between the two brands. In particular, note the tapered walls of the box ends, a somewhat unusual feature common to P&C and Thorsen but rarely seen elsewhere. Thorsen's production from approximately 1950 onward brought chrome-plated finishes along with minor changes in the markings. Fig. 8. Thorsen 1240 3/4-Drive 1-1/4 Socket, with Inset for Broaching, ca. Mid 1950s. Fig. 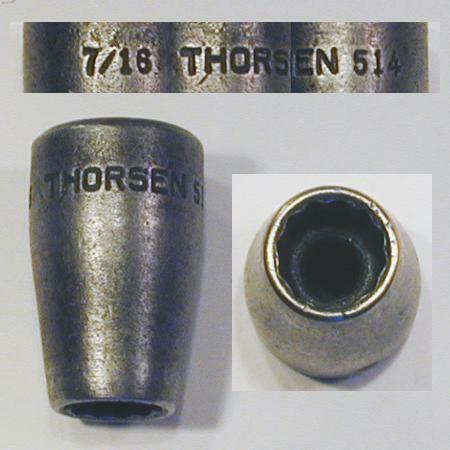 8 shows a 3/4-drive Thorsen 1240 1-1/4 socket, stamped with the Thorsen "sunrise" logo in between the size and model number. The drive end has a dimple in one wall (visible under the size marking) to help secure the detent ball of a drive stud. The drive end of the socket has a dimple in one wall (visible under the size marking) to help secure the detent ball of a drive stud. The use of the "sunrise" logo on this socket appears to be quite rare, as this socket is currently our only example. According to the trademark records, this mark was first used in 1953, placing the likely production date for this socket in the mid 1950s. Fig. 9. 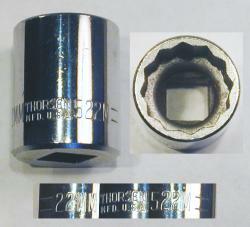 Thorsen 77J 3/8-Drive Ratchet, with Insets for Reverse, Side View, and Marking Detail. Fig. 9 shows a 3/8-drive Thorsen 77J open-style ratchet, stamped "Thorsen" with the model number. The overall length is 7.3 inches, and the finish is chrome plating. Fig. 10. Thorsen 53 1/2-Drive 5 Inch Extension, with Inset for Marking Detail. Fig. 10 shows a 1/2-drive Thorsen 53 5 inch extension, stamped "Thorsen" and "MFD. U.S.A." on the drive head. The overall length is 5.6 inches, and the finish is chrome plating. Fig. 11. Thorsen 375 3/8-Drive Screwdriver Bit, with Inset for Marking Detail. Fig. 11 shows a 3/8-drive Thorsen 375 screwdriver bit, stamped with "Thorsen" and the model number. The overall length is 2.6 inches, and the finish is chrome plating. Fig. 12. Thorsen 2120 5/8x11/16 Short Offset Box-End Wrench, with Insets for Side View and Marking Detail. Fig. 12 shows a Thorsen 2120 5/8x11/16 short offset box wrench, stamped with the Thorsen name and fractional size at one end, with the model number and other size on the reverse. The overall length is 6.0 inches, and the finish is chrome plating. Fig. 13. Thorsen 2218 9/16x5/8 Offset Box-End Wrench, with Inset for Side View. Fig. 13 shows a Thorsen 2218 9/16x5/8 offset box wrench, stamped "MFD. U.S.A." with the Thorsen name, model, and fractional sizes. The shank also has a forged-in code "4" visible at the left. The overall length is 9.1 inches, and the finish is chrome plating. Fig. 14. Thorsen 3016 1/2x9/16 Open-End Wrench. Fig. 14 shows a Thorsen 3016 1/2x9/16 open-end wrench, stamped with the Thorsen name and fractional sizes on the shank, and with a forged-in code "3" visible at the left. The overall length is 6.6 inches, and the finish is chrome plating. Fig. 15. Thorsen 3018 9/16x5/8 Open-End Wrench. Fig. 15 shows a Thorsen 3018 9/16x5/8 open-end wrench, stamped "MFD. U.S.A." with the Thorsen name and fractional sizes on the shank, and with a forged-in code "5" visible at the left. The overall length is 7.1 inches, and the finish is chrome plating. Fig. 16. Thorsen 3019 19/32x11/16 Open-End Wrench, with Inset for Side View. Fig. 16 shows a Thorsen 3019 19/32x11/16 open-end wrench, stamped "MFD. U.S.A." with the Thorsen name and fractional sizes on the shank, and with a forged-in code "7" visible at the left. The overall length is 7.4 inches, and the finish is chrome plating. Fig. 17. Thorsen 3020S 5/8x11/16 Open-End Wrench. Fig. 17 shows a Thorsen 3020S 5/8x11/16 open-end wrench, stamped "MFD. U.S.A." with the Thorsen name and fractional sizes on the shank. The overall length is 7.8 inches, and the finish is chrome plating. Fig. 18. Thorsen 3020 5/8x3/4 Open-End Wrench, with Inset for Side View. Fig. 18 shows a Thorsen 3020 5/8x3/4 open-end wrench, stamped with the Thorsen name and fractional sizes on the shank, and with a forged-in code "V" visible at the left. The overall length is 8.2 inches, and the finish is chrome plating. Fig. 19. Thorsen 2012 3/8 Combination Wrench. Fig. 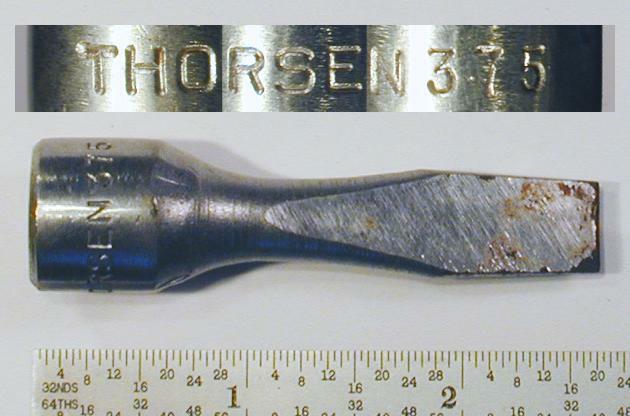 19 shows a Thorsen 2012 3/8 combination wrench, stamped "Thorsen" with the fractional size on the front. The shank also has a forged-in code "V" visible at the left. Fig. 20. Thorsen 2014 7/16 Combination Wrench, with Insets for Side View and Reverse Detail. Fig. 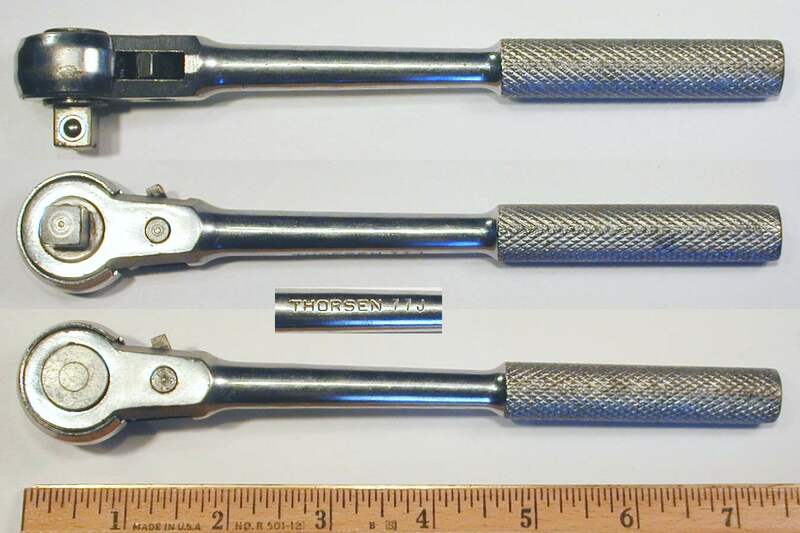 20 shows a Thorsen 2014 7/16 combination wrench, stamped "Thorsen" with the fractional size on the front, with "Made in U.S.A." and the model number on the reverse. The shank also has a forged-in code "R" visible at the right. The overall length is 5.1 inches, and the finish is chrome plating with polished faces. Fig. 21. Thorsen 2020C 5/8 Combination Wrench, with Inset for Side View. Fig. 21 shows a Thorsen 2020C 5/8 combination wrench, stamped "MFD. U.S.A." with the fractional size and model on the shank. The shank also has a forged-in code "P" visible at the right. The overall length is 6.2 inches, and the finish is chrome plating with polished faces. Fig. 22. Thorsen 2022C 11/16 Combination Wrench, with Inset for Side View. Fig. 22 shows a Thorsen 2022C 11/16 combination wrench, stamped "USA" with the fractional size and model on the shank. The shank also has a forged-in code "B" visible at the right. The overall length is 7.1 inches, and the finish is chrome plating with polished faces. Fig. 23. Thorsen 2024C 3/4 Combination Wrench, with Inset for Side View. Fig. 23 shows a Thorsen 2024C 3/4 combination wrench, stamped "USA" with the fractional size and model on the shank. The shank also has a forged-in code "H" visible at the right. The overall length is 8.0 inches, and the finish is chrome plating with polished faces. Fig. 24. Thorsen 2026 13/16 Combination Wrench, with Inset for Side View. Fig. 24 shows a Thorsen 2026 13/16 combination wrench, stamped "MFD. U.S.A." with the fractional size and model on the shank. The shank also has a forged-in code "R" visible at the left. The overall length is 10.1 inches, and the finish is chrome plating with polished faces. Fig. 25. Thorsen 2030 15/16 Combination Wrench, with Inset for Side View. Fig. 25 shows a Thorsen 2030 15/16 combination wrench, stamped with the fractional size and model on the shank. The shank also has a forged-in number "1" visible at the left. The overall length is 12.0 inches, and the finish is chrome plating. Fig. 26. Thorsen Speed-Hed 7800 5/8 Combination Wrench, with Insets for Side View and Marking Detail, ca. 1950s. Fig. 26 shows a Speed-Hed 7800 5/8 combination wrench with a ratcheting-action open end, stamped "Pat. Appl'd For" on the front, with "Thorsen Tools" and "Oakland - Calif" stamped on the reverse. The overall length is 8.1 inches, and the finish is chrome plating. The patent pending status refers to patent #2,652,735, filed by G.W. Wilder in 1949 and issued in 1951. The design and construction of this example strongly suggest Vlchek as the manufacturer, as does the forged-in number "9" near the open end. The markings on the tool also point to a contract maker, as Thorsen did not usually mark its Oakland location on tools. In 1957 Thorsen began offering an economy line of tools under the "Action" brand. Fig. 27. Action 530A 15/16 1/2-Drive Socket, with Insets for Broaching and Marking Detail, ca. 1957+. Fig. 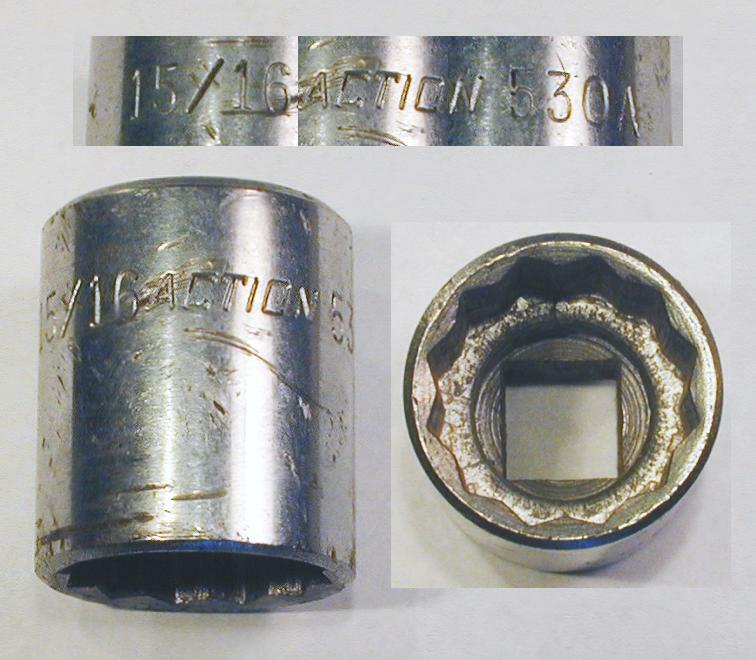 27 shows an Action 530A 15/16 socket, stamped "Action" with the fractional size and model. Fig. 28. Action 2022A 11/16 Combination Wrench, with Inset for Side View, ca. 1957+. Fig. 28 shows an Action 2022A 11/16 combination wrench, stamped "Action" with the fractional size and model, and with a forged-in code "4" visible at the left. The overall length is 8.7 inches, and the finish is chrome plating. Fig. 29. Action 2024A 3/4 Combination Wrench, ca. 1957+. Fig. 29 shows an Action 2024A 3/4 combination wrench, stamped "Action" with the fractional size and model, and with a forged-in code "9" visible at the left. The overall length is 9.0 inches, and the finish is chrome plating. Fig. 30. Action 2028A 7/8 Combination Wrench, with Inset for Side View, ca. 1957+. Fig. 30 shows an Action 2028A 7/8 combination wrench, stamped "Action" with the fractional size and model, and with a forged-in code "2" visible at the left. The overall length is 11.0 inches, and the finish is chrome plating. During and after the 1970s Thorsen's production changed significantly -- production shifted to a new factory in Texas, and management changed as Thorsen moved from one conglomerate to another. Fig. 31. Giller 2020 5/8 Combination Wrench. Fig. 31 shows a Giller 2020 5/8 combination wrench, stamped "MFD. U.S.A." with the size and model number. The shank also has a forged-in "M" code visible at the left. The overall length is 8.4 inches, and the finish is chrome plating. Fig. 32. Thorsen Later 522M 1/2-Drive 22mm Socket, with Insets for Broaching and Marking Detail, ca. Mid 1970s. Fig. 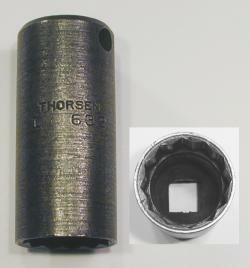 32 shows a later 1/2-drive Thorsen 522M 22mm socket, stamped "Thorsen" and "MFD. U.S.A." with the size and model number, and with "=" symbols bracketing the markings. The finish is polished chrome. The drive end of the socket has oval grooves cut in all four walls to help secure the detent ball of a drive stud. The right inset shows the interior of the socket, with an annular ring of displaced metal indicating hot-broached construction. As Thorsen switched to cold-formed socket production in the late 1970s, this socket was likely made in the mid 1970s. A close look at the "Thorsen" marking on this tool shows the stylized form of the name, with descenders on the "T" and angled sections for the "S". Fig. 33. Thorsen 77 1/2-Drive Ratchet, with Insets for Reverse and Side View. Fig. 33 shows a later 1/2-drive Thorsen 77 ratchet in an open style, stamped "Thorsen" and "MFD. U.S.A." on the shank. Thorsen was offering ratchets in this open-gear design as early as the mid 1930s, although this particular example is much later. No patent is known for the design, and other companies (notably Duro Metal Products) offered similar ratchets in later years. Fig. 34. Thorsen Later 536 1/2-Drive 1-1/8 Socket, with Inset for Broaching, ca. 1978+. Fig. 34 shows a later 1/2-drive Thorsen 536 1-1/8 socket with cold-formed construction, stamped "Thorsen" and "MFD. U.S.A." with the size and model number, and with "=" symbols bracketing the markings. The right inset shows the interior of the socket to illustrate the cold-formed construction.